Want to Eat Out of a Monkey's Head Just Like 'Temple of Doom'? Last weekend marked the official 30th anniversary of Indiana Jones and the Temple of Doom, and we featured a collection of nostalgic looks back at the film that is actually a prequel to Raiders of the Lost Ark. But much like the Ghostbusters 30th anniversary, we're perfectly fine with tributes to the adventure film popping up throughout the year. In fact, much like cool Ghostbusters stuff hitting this year (including the LEGO version of the Ecto-1), there's a fun little purchase that any true fan of Indiana Jones would probably like to add to their shelf. But it might not be for the faint of heart, and it could get you some weird looks. Does everyone remember this scene from Indiana Jones and the Temple of Doom? 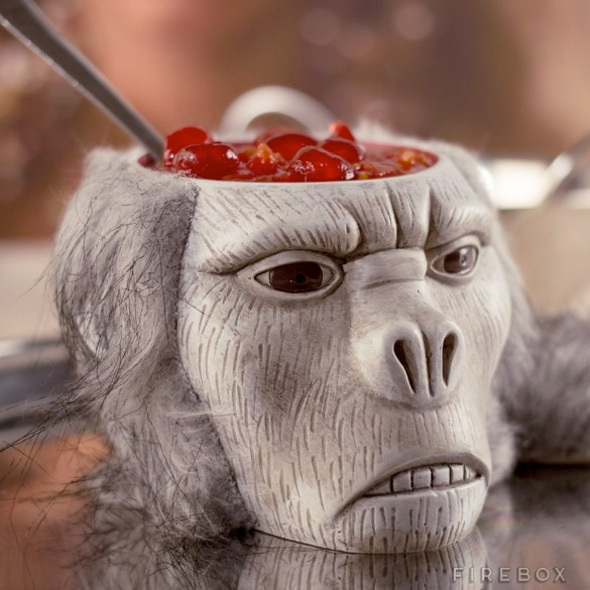 Now you can have your own chilled bowl of monkey brains. Well, you can have the monkey bowl anyway. Roast chicken and Shepherds pie just won't cut it any more. Your body is a temple, a temple of doom, and it deserves to be fed something far more exciting. So why not liven up meal times with this Monkey Brains Bowl and scoop chilled cerebral delicacies straight from its hairy gaping cranium. If this fine piece of severed simian storage is good enough for his Supreme Highness, the Maharajah of Pankot (and he knew how to party), then it's certainly good enough for you. You can fill it with all sorts of exotic delights like crispy Coleoptera beetles, Eye-ball soup and "Snake Surprise" …or something more boring, like cornflakes. It's an undeniably tasteful dining vessel, though the sight of it may cause more squeamish dinner guests to roll their eyes back and faint melodramatically. 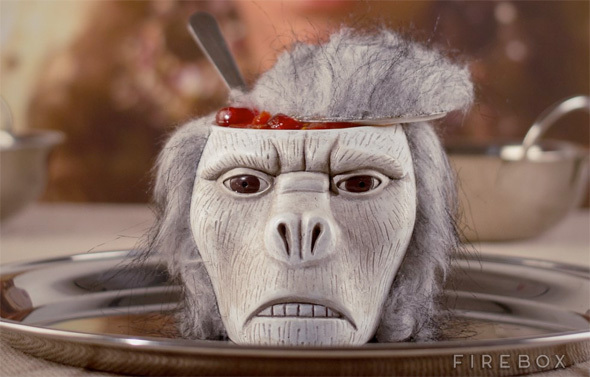 Gizmodo called our attention to the bowl modeled after the monkey head featured in the above dinner scene from Temple of Doom that totally grosses out Kate Capshaw, the wife of director Steven Spielberg. It's not a perfect replica, but it's certainly modeled after the monkey bowl from the film. It's a cool bowl, but we're not sure it would be too great for eating, especially with that hair so close to the edge. Plus, your significant other might not enjoy it too much. But it would certainly look nice on a shelf next to The Sankara Stones and The Holy Grail. You'll have to make red Jello to put in there at least once. Will you buy one? I would absolutely get this if it looked decent. 60 bucks for this cheap-looking piece of junk? Hell no.